Can I Play Oregon Megabucks Online? Read 3 Reviews! Oregon Megabucks Exposed — Add the “Kicker” to Your Play! Oregon’s Megabucks Lottery is a lovely mid-range jackpot with lots of ways to win. It doesn’t grow in leaps and bounds like some of the mega jackpots, but it is an official lottery run with very clear rules and regulations. The Kicker isn’t just a punch line, but can multiply your prize four times! Players simply choose six numbers from forty-eight for each ticket line. Two ticket lines are purchased at a time. Players can opt for a quick pick to play. Six numbers are drawn three times a week: Monday, Wednesday and Saturday. There isn’t a bonus or star number drawn. The prize tier goes from six numbers down to four to win something. Players also have the option to add the “Kicker” to their play. At an additional cost per ticket line, this multiplies each prize tier times four excluding the jackpot. That’s a nice kick up for the prize amounts. Jackpot winners have two options on how to receive their money – an annuity or lump sum. The annuity is paid over 25 years annually and takes into consideration the entire jackpot amount. If a player opts for a lump sum, it is half the published jackpot amount for the draw. Keep in mind, the tax man takes his (I’m being gender insensitive) share. Prizes over $600 have to be reported to the Oregon Department of Revenue. Tax is withheld for prizes over $5,000 with 25% federal and 8% state tax. For non-residents, players can file a tax form and possibly get some of this back though we haven’t been able to nail the actual percentage. What is really interesting is that players in the US might have to pay as much as 39.6% tax. On top this, the US has added a 3.8% Medicare Sur Tax on income over $200,000 – but this seems to happen when a US income tax form is filed and not when a player gets their jackpot. Oregon has a law in effect that a minimum of 50% of all money earned on the sales of lottery tickets must go back to players in the form of prizes. Megabucks takes it one step further and puts 64% back into prizes. The rest of the money is used in administration (around 4%) and goes to support government initiatives, including public education, economic development, and natural resource programs. You won’t find any complaints about this lottery. It’s official and supervised by regulatory bodies, both state and federal (don’t forget the IRS). The Oregon Lottery, who runs Megabucks can be reached by telephone, snail mail, and email during Pacific Time business hours, though I’m not sure why a player would want to. Their home page, FAQ and Terms & Conditions are pretty good. Would you mind rating Oregon Megabucks ? This is an officially run lottery that is clear on how to win and what a player gets even for the jackpot. It doesn’t grow that fast as some other lotteries, at the same time it has good odds and the “Kicker” does add to the prize tiers other than the jackpot. 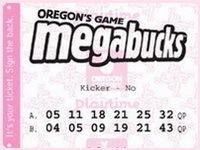 Oregon Megabucks Lottery does get a thumbs up. The overall odds of winning something are 1:25.53. I personally like the concept of the Kicker! How Much Does It Cost to Play Oregon Megabucks Online? U forgetting extra cons. About the 3/6 match prize, thelotter 4exmpl wont give freeticket quickpick. People complained because u winning free quickpick ticket on 3/6match should suppose to go back and get free quickpick ticket from the store and they have to put it the free quickpick ticket manually on clients account. Same way how they give a manual price for exmpl la primitiva match one number u get ticket price back.. Lot of people wouldn’t know because Oregon lottery website is not accessible outside the us. Just some digging u find it. Instead of 3/6 free ticket match u get 1$ price. Info is on oregonlottery megabucks did i win. When collect all megabuck wining ticket would attach quickpick ticket to the winning ticket of the client so would know who is the winner. Not mixing free tickets for the winner. Oregon MegaBucks are favorite! For the most of all – it’s three times a week! Playing this game through TheLotter. Hope to win it one day as Iraqi player did.